Cumbrian based musician Matt Cowe presents a new show featuring the music of 50’s American country guitar legend Chet Atkins. Many musicians regard Chet Atkins as one of the greatest guitarists of all time and his musical impact was huge with stars like George Harrison and Mark Knopfler, citing him as a major influence. Chet pioneered a style of guitar playing where the guitar plays the bass, rhythm and melody all at the same time which dumbfounded his contemporaries and to this day is still considered a very difficult style to master. Matt has long been an aficionado of Chet’s music and has studied it closely for the past ten years. Matt is joined by superb local musicians, Jon Moore (guitar), Steve Simpson (double bass) and Jack Davies (drums). Matt has played at the RH once before, when he guested at the epic Tim Kliphuis concert, and Jon Moore will be remembered as leader of the gypsy swing band 'Hotcha', while Steve Simpson has featured with both Hotcha and Steve Andrews. Anne-Marie Sanderson's voice is evocative of birds in flight - soaring, gliding, swooping - and it finds its home among the tall trees of her deft guitar work. Describing Anne-Marie's distinctive indie-folk music in these terms is apt; she is an artist who casts a careful eye and attentive ear to the natural world, alternating between wide-eyed wonder and wry observation. 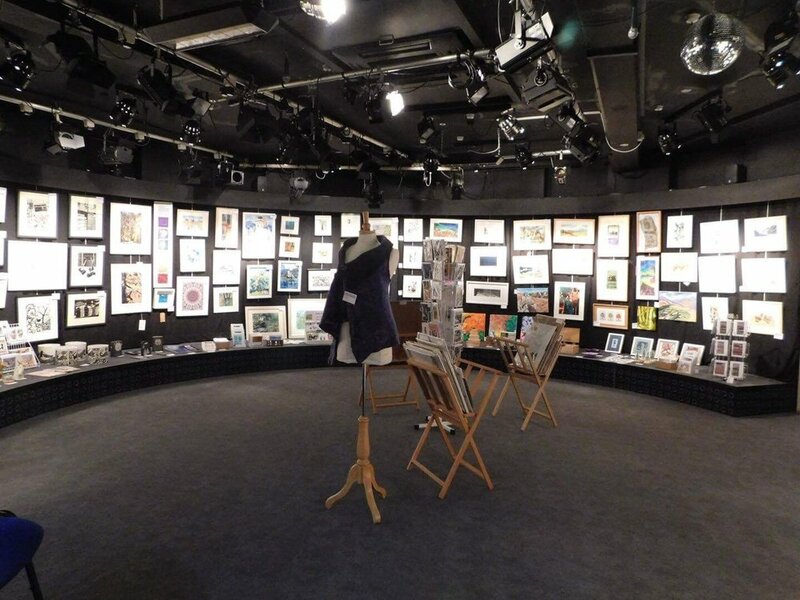 We are delighted to be hosting The 28th Staveley Roundhouse Annual Art Exhibition this year and after last year’s success, we hope that even more of our very talented local artists will submit their work for sale. Art work must be the original work of the entrants, and not previously exhibited at a Roundhouse Exhibition. Etchings, lino-cuts and other original prints will be welcome, as will some 3D work.Copies and photocopies, decoupage, fabric and similar crafts will not be accepted for exhibition. The Exhibition is open for submissions from residents of the parishes of Ings, Kentmere and Staveley, and to current members of The Roundhouse. There will be a preview evening on Wednesday 8th October from 7pm – 9.pm to which Roundhouse members, exhibitors and invited guests are welcome . For admin queries and entry forms contact: roundhouseartstaveley@gmail.com For art or hanging queries contact: Wendy Randall, 01539 821524 or at the above e-mail address putting FAO Wendy Randall in the subject line. Members of Green Door, the region’s leading artists’ collective, are returning to Staveley Roundhouse for another weekend of Affordable Art from 30 November 2 December. With more than 200 pieces of work from Green Door artists, work will include paintings, prints, photographs, ceramics, glass, wood, jewellery, textiles and sculpture, all priced at £150 or less. You’ll also find greetings cards smaller items, as well as unique Christmas gifts. Open 10am - 4:30pm* (* Sunday 4pm). Northern Sky are a Kendal-based band with a growing following in and around Cumbria. The BBC Radio show ‘Introducing’ has selected several of their songs for airplay their song, "Catch The Light" has been featured as "Track of the Week" on BBC Radio Cumbria. They have also supported several acts at venues accross the county. The band comprises of Abby Harman (vocals), John Osborne (acoustic/electric guitars & vocals), Amy Beeton (cello), Lucy Johnson (vocals) & Martin Kirton (drums/cajon/percussion). A hostess in the West End ‘gentlemen’s clubs’, Ruth Ellis works hard, plays hard and dreams of a movie-star life. Yet in 1955, the self-styled ‘blonde bombshell’ is convicted of murder and becomes the last woman to be hanged in Great Britain. Ruth’s crime is re-examined in the light of the society she lived in and the experiences that led to her shooting her lover. Through the eyes of film noir Detective Inspector Gale – and the haunting voice of Billie Holiday – The Thrill of Love explores the enigma of Ruth Ellis: a woman whose short but explosive life still resonates. An amateur performance by arrangement with Nick Herne Books. When Enid sadly died last year her daughter Jackie and husband Brian kindly agreed to host our annual quiz night which she ran so brilliantly for many years in her memory. Join us for an evening of brain-wracking fun with a wide selection of subjects on offer. This year for a change we will be having a home made curry supper served in the middle of the quiz. Bring a bottle of whatever you wish to drink, we will provide glasses (and wash them up). We have room for 10 teams of 4, or you can book individually and we will put you in a team. If you missed our sell out production here at The Roundhouse, why not catch it in the new year at The Heron Theatre in Beetham? The children are played by adults in this warm, witty and funny play. Mrs Horrocks' class of seven year olds is about to perform their nativity play at Flint Street Junior School for the proud mums and dads – and the occasional social worker. Squabbles arise when Gabriel wants to play Mary, the Star grumbles he's not a proper star like they have at NASA, Herod won't stop waving to his mum and dad and the subver-sive Innkeeper is determined to liven up the traditional script. And then the stick insect escapes……. Tickets Members £12.50 Guests £14.50 includes a drink and a mince pie! Celtic Connections Danny Kyle Award winner Bella Gaffney (guitar, vocals) and acclaimed mandolin player Polly Bolton have come together, fusing Celtic folk with bluegrass in an exciting new collaboration. Tickets members £9 Guests £10 BOOK HERE! Bella Gaffney hails from Bradford. She writes folk inspired songs which she performs along with her own original arrangements of traditional pieces. Bella released her second album 'Heaven Knows' in the summer, and has supported folk luminaries including Jon Boden, Cara Dillon and Altan. She has appeared at festivals including Celtic Connections, Southwell Folk Festival, Bromyard folk festival, Moseley Folk Festival, Beverley Folk Festival, HebCelt and many more. Bella also performs with Midlands based band Bric-a-Brac. A COMMUNITY FILM SCREENING OF THOUGHT PROVOKING, INSPIRING, AMUSING & CREATIVE SHORT FILMS, MADE BY VILLAGE PEOPLE, ABOUT VILLAGE LIFE & BEYOND!! Organised by locally based Shelley Barlow. Shelley hopes that people will share their stories of the interesting things they get up to via the medium of film. Open to people who already have a film or would like to make one specially for the event. You can use your camera, tablet or phone to create your own film for 'Staveley Unwrapped'. There is to be a film making day on the 23rd June 2018 (£35 per person) with Dom Bush, a professional film maker who will help people create their own films and help will be given with editing and preparing the film for viewing. For more details n how to enter a film or to buy tickets for the event contact Shelley on 07866747685 or email whatsonstaveley@gmail.com. Last date for film entries is the 17th September 2018. "A great excuse for our community to turn out and celebrate our amazing community!! Once grande dames of Hollywood, by 1962 arch-rivals Bette Davis and Joan Crawford were in danger of becoming has-beens. Then an opportunity came along; to appear together in a new movie called Whatever Happened to Baby Jane? Bette & Joan depicts the two stars, in adjacent dressing rooms, between takes on the set of Baby Jane. While Joan manages her anxiety by lacing her Pepsi with vodka and signing photographs for her beloved fans, Bette chain smokes and muses on her lovelife, and her ability to pick a decent script, never a decent man. Book now- click on date. Keen to boost his flagging career, Hollywood action hero Jefferson Steele arrives in England to play King Lear in Stratford – only to find that this is not the birthplace of the Bard, but a sleepy Suffolk village and the cast are a bunch of amateurs trying to save their theatre. Jefferson’s monstrous ego is tested to the limit by the enthusiastic am-dram thespians. As acting worlds collide and Jefferson’s career implodes, he discovers some truths about himself – along with his inner Lear! This production contains occasional bad language. BOOK HERE (Click on date) Mon. 23rd July, Tues. 24th July, Wed. 25th July, Thurs. 26th July, Fri.27th July, Sat. 28th July. Piano maestro Keith Nichols makes his third visit to the Roundhouse - one of his favourite venues and favourite pianos, he tells us (but maybe he says that to all the girls). This time he is teamed with two other musicians who already have a much longer association with our theatre - Steve Andrews (saxophone and clarinet) and Roy Cansdale (double bass). Quite apart from the quality music these three will produce, Keith and Steve are both famed for their witticisms and depth of musical knowledge, so we can expect to be amused as well as entertained. Try not to miss this one! Mixing global rhythms with folk tunes from Quebec to Spain, Scandinavia to Sussex and everywhere in between, this is a quirky celebrationof our rich musical heritage – and it works so well! TICKETS FRIENDS £9 GUESTS £10 BOOK HERE! The Busquitos provide a very catchy mix of brilliantly played music together with some dazzling, funny entertainment that will put a smile on everyone’s face! The fun they have playing their music rubs off on their audiences. Come and sing along to one of their catchy jazzy tunes. Musical entertainment for all ages! The Busquitos have proven their skills on the streets, parties, pubs and big stages at international jazz festivals. They performed in Holland, Belgium, Germany, The UK, Ireland, Switzerland, Italy and Turkey, as well as a two weeks tour in South-Korea! David and Caroline are hosting a dinner party but David has a secret. Once the cat is out of the bag there is no way to stop the evening developing into a battleground of recriminations, explanations and cruel home truths. Mary and Jack have a marriage lacking in magic. Their usual boring Saturday evening is suddenly changed by the unexpected arrival of friends, Maureen and Ted. The whisky bottle is uncorked and soon inhibitions begin to fall away. Neighbour Dennis also innocently joins the mayhem which unfolds. These play dates have been rescheduled from February 5th to 8th due to one of the cast suffering a bereavement. Monday 26th March Tuesday Sold Out! Wednesday Sold Out! Thursday SOLD OUT! Pianist and entertainer, Peter Gill presents a tribute to the wit and song-writing skill of that most English of Englishmen, Noel Coward, who said of himself I am an enormously talented man and there is no pointin denyingit. Born in 1899, Coward was an actor, writer, composer, director, producer, and in later life painter– and he excelled at them all. Peter will remind us of his dazzling wit and perform such gems as A Bar on The Piccola Marina, Don’t Let’s Be Beastly To The Germans, Mrs Worthington, There Are Bad Times Just Around The Corner and Mad Dogs & Englishmen. Previously natives of Cumbria but now residing in East Yorkshire, Jessica Lawson & Phil Simpson sing and accompany themselves on autoharp, acoustic guitar, mandolin and melodeon. Their original songs reflect a background in folk music and a love of Americana; singing stories about the sea, love, loss, and a few ‘fallen’ women. The duo’s notoriety on the folk scene took hold when Jessica’s debut EP, Molly of the Tyne, was released in 2011 on Paper Plane Records. They have been in demand at festivals and concerts across the UK and Europe ever since and their reputation continues to grow. Jessica and Phil have performed a number of high profile and exciting shows, alongside Eddi Reader, Cara Dillon and Barbara Dickson to name but a few. Hard Times is a classic tale from the pen of Charles Dickens, the master story teller. It is a tale of loss, love, pride before a fall and a deepening divide between rich and poor. Sound familiar?! 17 actors, playing multiple parts, sing, dance and tell a story full of pathos, humour and intrigue, all accompanied by original music. It reveals a society in turmoil, as relevant today as it was back in the 1860s. NOW SOLD OUT! This hilarious rompis set in Brighton in the 1960s and follows the romantic and lustful ambitions of the apparently respectable Wicksteed family. With a succession of characters ranging from a rampant doctor and a randy vicar to a frustrated flat-chested spinster and a baffled domestic cleaner, this rollicking tale is as saucy and English as a seaside postcard. ...'Habeas Corpus' has all the ingredients of a classic farce, spiced with the warmth and humanity of Alan Bennett's razor-sharp wit." The ticket price includes a free glass of wine! Keith’s first appearance at the Roundhouse last year is unlikely to be forgotten by those who attended and were duly dazzled by his skills as a pianist and raconteur. This time Keith will be partneredby clarinetist Trevor Whiting, making up a duo who work together very frequently. Trevor, as well as being recognised as one of the best clarinet players in any style inEurope, is immersed in and very knowledgeable about early jazz. Apart from his work with Keith and freelance appearances all over the country Trevor is the first call reed player for the legendary ChrisBarber. We can expect to be regaled by a variety of anecdotes from the fascinating annals of jazz in the USA and UK. There will be musical fireworks of the highest caliber. Veteran pianist Tim Belford, who played in the very first Steve Andrews quartet performance at the Roundhouse many years ago (and many more subsequently) died last year. His legacy to jazz in Cumbria was immense, spanning big bands in Carlisle, a long spell with the semi-legendary Mick Potts Gateway Jazz Band, and an even longer one with Bruce Carnaffin’s Mainline Jazz. That band included Steve Andrews in its original line-up, leading to Steve making the far-from-difficult choice of Tim as his pianist when he formed his Quartet, which performed frequently at Carlisle Jazz Club and of course the Roundhouse. Tim very quickly became a favourite performer here, displaying his endless invention and wit at the keyboard in a completely un-flashy way, as befits a man who was known for his good humour and modesty. We’re pleased that his widow Liz has accepted our invitation to attend this concert in Tim’s honour, and the band is composed of musicians who played with him on many occasions. Apart from Steve on whichever selection of reed instruments he chooses from his vast collection, you will hear Roy Cansdale on double bass (making a rare visit from Gloucestershire), Roly Veitch on guitar and Euan Pringle on drums: all people who played regularly with Tim in Carlisle and elsewhere. This will be a special night in memory of a special man. Tickets £14.50 Members £12.50 Price includes a free glass of wine! "Darkly comic, tongue-in-cheek, and highly imaginative, a Psychiatrist decides to make every decision by following options given to the dice. As he delves further into giving up responsibility for his actions, and introduces a patient to the same idea, mayhem ensues and the rules become twisted..."
After performances in the Edinburgh Festival, and tours to USA, Israel, Hong Kong, Africa, Central America and sell-out shows in Australia recently, this funny, gripping and thoroughly entertaining ‘play with movement’ comes to Staveley. Tickets £14.50 Members £12.50 Price includes a free glass of wine! "Novel and intriguing - a seductive package"
"A brilliantly unique combination of dialogue and movement, performed by two extraordinary performers"
This comedy classic features cantankerous novelist Charles Condomine who is researching the occult for his new novel. The sceptical author invites an eccentric clairvoyant, Madame Arcati to his house for an elegant dinner party. While consumed in a trance, she unwittingly conjures up the ghost of Charles’ deceased first wife, the rather naughty Elvira. Elvira soon upsets his new wife, the straight-laced and super-rational Ruth. If Charles wants his latest marriage to stand a chance, he’d better conjure up a solution... and fast! BOOK HERE (Click on date) 4th & 6th and 11th 12th & 13th May. Kendal Yarns- Best of The Fest! Best of the Fest 26th, 27th,28th & 29th April. Last July ,a vibrant festival of plays commissioned by Kendal Community Theatre took to the streets of Kendal. A total of 58 new 15-minute plays penned by writers of all ages, were performed several times by local actors over one week in various locations throughout the town. The festival culminated in a gala performance in Kendal Town Hall when one play chosen by each of the directors was performed.Come and see six of the best of these short plays in one evening! Kendal Date Night by Laura Howard (Carter): Speed dating in the Globe! Hannah’s Choice by Sheelagh O’ Brien: A sacrifice to survive – to chop or not to chop. Men of Progress by John Scott: From snuff to fracking, spin rules OK.
Kendal Community Theatre was founded in 2011 by six dedicated people. Since A Passion for Kendal was performed on the streets of Kendal in 2012, they have commissioned new work and produced a range of exciting plays. They are committed to experiment in types of theatre and a variety of spaces. Set against a world of one night gigs this gritty comedy reveals the highs and lows of performing on the club circuit in the north of England. A karaoke competition brings together seasoned pro, Vince Steel, and talented beginner, Teena White in an explosion of talent and creativity. With a sensational mix of classic pop songs as a soundtrack to their journey, Teena and Vince’s tenuous relationship unfolds along the way. Starring Kate Vernon and Bob Christie. In addition to sporting one of the best band names in the North-west, Hotcha! have, over the past ten or so years, established themselves as the foremost gypsy jazz group in the area. For those unfamiliar with gypsy jazz who may like to know what to expect, the first thing to say is that it has little to do with giant hoop ear-rings, flowing scarves and calf-length leather boots – in other words, the Hollywood image of the European gypsy. But the music is based on the sound of the incredibly talented and influential Belgian gypsy guitarist Django Reinhardt, who in the 1930s teamed up with the French violinist Stephane Grappelli to form the Hot Club de France. These far-from-kindred souls took the jazz world by storm, and there are still innumerable bands playing in their style but introducing new tunes and influences from other forms of music, thus keeping the tradition alive and fresh. Hotcha! is a fine example of this, and we guarantee that you’ll enjoy their brand of quiet, swinging, heartfelt jazz in the ideal acoustic setting of the Roundhouse. Why not start the New Year by trying to answer some fiendish quiz questions devised by Enid and her team? Join us for an evening of brain-stretching fun with a wide selection of subjects on offer. There is also a Pie And Pea supper served in the middle of the quiz. We have room for 10 teams of 4, or you can book individually and we will put you in a team. Tickets are £8.50 which includes your supper, please let us know if you are a vegetarian. We’ll provide glasses (and wash them up) but bring along your own drinks! Please ring or email for availability. BOOK HERE (A booking fee applies)- Click on the date you wish to attend! Wrapping up a year of some very fine jazz at the Roundhouse – remember the enthralling Keith Nichols/ Nick Ward performance – we are delighted to welcome back local heroes, the High Society Jazz Band, for their annual Christmas thrash. The band’s personnel has now settled down, and is the same as last year (see below), while their popularity has spread to even more foreign parts: try Buxton and Glossop. But they are very glad to have been booked in relatively nearby Staveley for a gig which they always look forward to immensely. The music will be very much the mixture as before, with lots of traditional jazz numbers, the odd Christmas song, and some unclassifiable comedy material – some of which they claim may be intentionally funny. Good time jazz is the watchword for this band, for performers and audience alike. Peter Boswell – cornet, trombone. Robin Andrews – drums, washboard and vocals.